Our dreaded flight to New Zealand wasn't the ordeal we expected, even though we were in transit for almost 24 hours. Our friend Mulvey arrived with his station wagon about 4 hours before our flight, giving us plenty of time to put out brush fires at the airport. With his cargo area filled to capacity with our 2 bikes and Bill's sister's car toting me and our luggage, we headed out for a brief "Good-bye" with my 90 year old mother and then it was on to the airport. Sunny skies would have been nicer, but the freeway traffic was light at 10 in the morning, making the downpour less important. 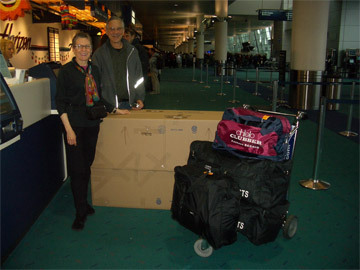 Portland: Mulvey & Barb with boxed bikes & luggage..
And things couldn't have gone better at the airport. Our plan to be there in advance of the 2 hour recommended time meant beating the long check-in lines, just as we had hoped. The counter clerk for Alaska Airlines didn't bat an eye at the boxed bikes. Though she made sure our 2 duffle bags just cleared the 50 lb limit, she didn't bother weighing the bikes that we'd worked hard to whittle down to 51 lbs each. And graciously, she didn't mention the extra $100 she was entitled to collect just because we had bikes. Had we actually been boarding Qantas in Portland as our tickets indicated and not their companion company, we would have had 70 lb limits per bag and no risk of paying extra for the bikes. Mulvey helped schlep the bulky bikes from the car to the check-in window and over to security, which was a huge help. The physical challenges of juggling the boxes and the luggage combined with the repeating admonition in the airwaves: "Don't leave your bags unattended" always makes the airport process an ordeal for 2 people--with 3 it was a snap. Our guardian angel Mulvey stayed around until we were through the last of the security and then we were on our own. The Portland airport has such a calming interior that we happily settled into a lovely, newer seating area with big windows, towering trees, and live plants. We relished the electrical outlet provided for each chair, plugged in our laptop to keep it fully charged, and sent out a last email using their free WiFi. Ah, our mid-day departure was off to an excellent start. Our uneventful 2 hour flight to LA left us with the expected but unwelcome 5 hour layover in LA. Tethered by our airport trolley to ease the burden of our almost 30 lbs in carry-on, laptop, and fanny pack overflow, we strolled the airport grounds in the pleasant sea breezes the hour before sunset and did a few laps on a set of outdoor stairs for a needed change in tempo. Once inside, we scouted for a rare electrical outlet and settled on the floor to resume working on our webpage that had been neglected for our entire 5 week Portland stay. And again at the gate, we were driven to the floor to scrounge one of the few plug-ins for computer users as we nibbled on our food stash. Our almost 12 hour Qantas flight to Auckland was much shorter than our bungled predictions based on European time zones had anticipated. The 8:30 pm boarding fit in well with our bedtime, and we we able to snooze for the better part of 6 hours after the late meal service. The seats in economy were just a smidge bigger than other airlines and seemed to drop back enough farther to convince our bodies to relax. Even the small pillows seemed to be enough better to help coax the sleep that is usually just out of reach on our trans-Atlantic flights. Everyone we spoke to had kind things to say about Qantas, and we are now among their fans. The just enough better seats, the biological-clock friendly timing of the overnight flight, and the little goodies eased the challenges of the long journey. The attendants passed out 2 goody-bags, the first with a a pair of cotton socks, a toothbrush with paste, and eye covers, all in a little zip bag with a lanyard for your neck. And before lights-out, they distributed other bags with a small bottle of water and snacks. We arrived in Auckland much more rested and relaxed than we ever expected. 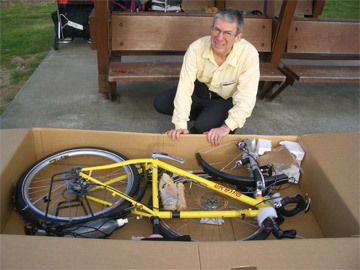 Bill unpacking the first bike outside Auckland's air terminal. We had lamented our 6 am arrival time in Auckland, expecting to feel hung-over from sleep deprivation and jet lag, but we were rested enough to make use of the day. After passing the very thorough biological inspection and other security checks, we were setting up our work area under a covered picnic area on the airport grounds by 7 am. It was barely warm enough to be outside and the fresh air and sounds of birds were a welcome backdrop for the next several hours spent assembling our bikes and gear. The bike reassembly job was going to be one of the easiest ever because of the non-bike, bike-boxes we'd used, so Bill took his time completing all of the finishing details. I busied myself with transferring our gear from duffle bags into our panniers and creating compact mounds out of the overflow for the back racks. The panniers would have to be carefully repacked over the next few days--right now the objective was only to secure the gear to the bikes. Doing the work necessary to be able to ride the 12 miles to our hotel was interspersed with trips into the airport terminal to use the toilets, get cash, get directions, and explore luggage storage options. Though it felt hopeless, we had steeled our resolve to try to store our bike boxes or at least our folded duffle bags for our return flight in 4 months. But our expectation of ditching them was quickly confirmed, with luggage storage rates ranging from $5-15 a day per item. It didn't matter if it was New Zealand dollars or US, as we were looking at spending hundreds of dollars for storage on items for which we'd paid under $50. We sadly abandoned our lovely new bike boxes, knowing we'd be paying Qantas an outrageous $60NZ to replace our $15US worth of boxes when we departed in March. It would likely cost that much for an oversized cab to haul free or cheap used boxes from a bike shop to the airport, so we'd use the next 4 months to reconcile ourselves to the expense. Our duffles and carry-on bags were compact enough to haul into the city in hopes of finding free or economical storage. But once there, we discovered that even at a youth hostel we'd be charged by the day for the little bundle, bringing the fee to over $200. Unexpectedly, our hotel was willing to set them aside for us at no charge, but only because it compacted down to 1 carry-on bag and the total value was so low on our disposable-grade luggage. Our enjoyable pedal into Auckland from the airport reinforced our first impressions that New Zealand was a pleasant place to be. We were greeted with fresh air, pleasant weather, and friendly people as we exited the airport. And side from the scalper rates they were all prepared to charge for luggage storage and new or used bike boxes, the people we first encountered were helpful and laid-back. Not so laid-back that they were inattentive--just not stressed out or disinterested. As we paused to check our new city map as we rode towards town, two 30-something guys on their ultra-light road bikes stopped to offer help. Map Man had done the scantest of planning for this 4 month trip and they quickly confirmed the general strategy: "head south and travel on the east coast." They too had touring bikes and were stunned we'd be in their country for 4 months. After offering their 2 top picks of bike travel guides for the country, they were off with look-back waves. We smiled: "Ah, New Zealand is a friendly place." Our biggest challenge of the morning was reacquainting ourselves with driving "on the wrong side" of the road. Darn those British anyway. "Ya, ya, ya, who is to say whose way of driving is right" but its only human to believe what is familiar to you is correct, and right or wrong, familiar is safer. Spending much of our summer in 2004 biking in Britain gave us welcome skills to fall back on, however. I immediately noticed that just being in traffic wasn't as terrifying as it had been when we first encountered this challenge, but the intersections were. The most disquieting aspect is looking at a car cutting through an intersection or traffic circle and wondering "What in the hell is he doing?" and realizing he is merely staying in his lane. It's also unnerving to glance over at a vehicle waiting at a light and discover there is no driver (or the operator is a dog)--or so it seems as the driver is in the shadows on the right side of the car. All of our almost instinctive ability to anticipate what the cars are doing at intersections is wrong in New Zealand. Crossing 4 lanes of traffic on a bike without a signal can be difficult enough, but with our mental muddle about predicting auto behavior, it was daunting. Like in Britain, we proceeded very carefully at each busy junction and relied our on collective judgment as to when it was safe to launch. We know that over the next 4 months that it will become easier but that we will still have to be extra vigilant at every intersection for our entire stay--we just can't trust our reflexes here. Bill kept reminding me that at 1 million people, Auckland was New Zealand's biggest city. But it was the least intensely urban 1 million I've ever seen. The 12 miles between the airport and city core were a continuous clustering of small communities, but communities that hadn't lost their sense of center. They were linked to each other by urban sprawl and yet not obliterated in the process. We stopped at an older supermarket on the way into the city to buy our picnic lunch and it definitely had a neighborhood feel. No big chain stores surrounded the market but old-time owner/operator shops with a fund-raiser sale underway in the open area. Three stories was a tall building in most of the communities which looked like their building sprees had been decades ago. We took in the pleasures of a little bay park as we munched on "cabin bread" crackers and tuna for lunch. Our crackers looked like a typical regional food and I was pleased when I spotted a small package under the towering 5 and 10 pound tins. The tins from Fiji immediately conjured images of stores of food stacked in the Australian Outback and earlier New Zealanders waiting for the next ship with familiar foods to arrive. The crackers were nothing to rave about but a little trophy of local cuisine for our first hours in the country. In addition to the firm but pale crackers, the apparent lava lining the shore caught Bill's eye. We briefly pondered if the land had a volcanic history and learned that afternoon that Auckland itself has almost 50 extinct volcanoes. The casual lifestyle we were so far encountering was underscored as we biked through the hilltop park that was on our path to town: a lovely, lush green area with picnic tables and cows. Never before in a country's largest city had we seen cows grazing it what must be their signature urban park. But there they were with many signs instructing park users not to bug the cows. We always love seeing animals on our rides (as long as they aren't overly interested in us) and the local cattle seemed to set the tone for what was to come in our travels through New Zealand. Downtown Auckland itself wasn't as charming with its uneasy blend of old historic buildings swamped by new high rises--the urban designers didn't quite get it right. The strips of itty-bitty Asian styled store fronts with gaudy signs mingled in with the department stores was an unsettling mix too. But several lush parks and the energy of the people on the streets made up for the design incongruities and we enjoyed spending our first nights in the bustle of the city's core. The multi-ethnic quality of Auckland struck us as soon as we exited the plane. More Asiatic features were in the throng than we were accustomed to seeing and both the features and the languages in the background reminded us we were in a new land. We were too ill-informed to know if these were largely the indigenous Maori people we were seeing and hearing or if there were other unfamiliar cultures jumbled in, adding to our confusion. A quick look in our Lonely Planet guidebook spelled it out: New Zealand and especially Auckland had embraced immigration. Auckland is considered the unofficial capital of the Pacific Islands and had also become a prime destination for relocating ethnic Chinese since liberalization in that country in the late 1980's. We were amazed at the range of peoples in Auckland, as in the grocery stores and parks we were as likely to hear Italian or a Slavic language in the background as any other language, some of which we couldn't begin to guess as to the origin. We read that the extreme south of New Zealand's South Island is 95% European, and so this rich blend of sounds would likely dwindle as soon as we left Auckland, though Maori is 1 of their 2 official languages. Find Auckland on the west coast of the northern island on the map at the left, the first named city from the top. Pre-booking our hotel room in Auckland had confirmed what we had read--that lodging prices were on the low-side in New Zealand. There was ample city lodging in the $US50-70 per night range, which can be hard to find in many large cities. Our inner city hotel, like a number of others, included kitchenettes in the rooms, which made it an even better value. But we kept reminding ourselves that we'd soon be in high season--December and January--so the prices would be going up. The grocery store prices were another matter and left us gasping. Bill bought a bottle of hydrogen peroxide, just has he had done in Portland a few days prior to treat his infected gum, and his $1 Portland purchase was the equivalent of $12 in New Zealand. That price differential wasn't exceptional but it was a single purchase that was easy to do the mental juggling with the differences in quantities and currency exchange. Some other seemingly ordinary items were 10 times what we generally pay. In contrast, canned tuna was in the range that we pay in the US and Europe, but just about everything else in the food department of a large supermarket was 2 to 5 times higher than we are used to seeing. One clue to the high prices was that the "bin-foods" that allow customers to buy odd quantities in bulk were priced in the equivalent of ounces instead of pounds (though they use the metric system.) The 100 gram prices looked about right for kilo prices to me. Surprisingly, the New Zealand prices for their home-grown products like yummy Braeburn apples and kiwifruit were about the same as sale prices for those fruits imported from New Zealand to the US. Just like in Iceland, we craved to understand the seeming idiosyncrasies of international pricing. The local wisdom in both island countries was that the high prices reflected the cost of shipping, but water transport is a fraction of what's spent on the distribution of goods over land. We finally concluded that it must be the small market size that drives the prices up rather than the collusion of capitalists in the more isolated countries. We'd arrived in New Zealand without the benefit of much research so our second day was devoted to answering the most predictable questions. Just being in a new country required some research time in the grocery stores--as much as we love to eat, we didn't want to spend too much time fussing with food over the next 4 months. We needed a primarily menu plan to minimize the time and money we spent procuring and preparing food each day. Navigating around the high prices and a slightly different availability took some time. After studying the inventories of 2 large supermarkets, we had a general plan. Our meal routine would be about the same as it had been in Germany and Italy this year, with a few small changes. The Italian red pestos we love for our pasta each night were available but even more plentiful were Thai and Indonesian curry sauces, which we'd begin sampling. Bread, which was the usual source of the bulk of our lunch time calories was quite expensive and not to our liking. White "balloon" breads were clearly the bread of choice and finding anything more substantial and flavorful was predicted to become the daily challenge. We also noticed that rather than fresh bread being a ritual as is the case in much of Europe, that the breads in New Zealand were made to last for days or weeks after purchase, which is certainly more convenient but not as palatable. From the food stores, we moved on to securing tourist information and the extremely helpful young trainee at Auckland's main office answered many of our questions. She concurred with the previous day's cyclists that we should make a beeline for the east coast of the North Island as it was the prettiest and also offered up her short list of "must see" locations on the 2 islands. Competition for lodging, even if we had planned to camping, would be stiff in the peak of the summer months of December and January. The info woman informed us that reservations along the premier stretch of the coast would need to be made a week in advance. Needing to make reservations always took away the spontaneity of travel and was something we generally avoided by dodging the hot spots in high season but it was the price we were paying for eluding winter in the northern hemisphere. The stack of free accommodation guides she gave us would be a big help but of course add unwelcome weight and bulk to our slightly trimmer loads. Knowing we'd be calling for reservations bumped the availability of coin operated pay phones and phone cards up the list of things to discuss. Where to find books stores and internet shops in Auckland were among the list of questions the "i Site" info lady patiently indulged. The good news was that much of New Zealand's tourist-oriented businesses were generally open for business 7 days a week with no pauses at lunch time and Christmas and New Year's Day were the only certain closure days we'd encounter. Knowing the business hours and days is key to carrying the minimum of food without risking missing a meal. We left the info office reassured that there was an abundance of beautiful scenery in our future and that there often would be easy, daily access to food markets but that we better get used to the prices and calling ahead for lodging. The next stops were to book stores for maps and a little more reconnaissance of budget shopping places in the city. The time zone differences were one of the fine points we hadn't worked out before flying, one of many details pushed aside in our short Portland visit that got postponed until we were underway. Much to our surprise, from the biological clock perspective, there was only a 3 hour difference: the time in New Zealand was 3 hours earlier than the west coast of the US--plus 1 day. We crossed the International Date Line and so we lost Friday. We left Portland Thursday night and arrived 12 hours later in New Zealand on Saturday morning. Being a day ahead will cause us some minor mental manipulations over the next 4 months but the lack of significant jet lag was a huge bonus for the beginning of our journey and will again be appreciated on the return to the States. We intentionally came to the southern hemisphere at this time of year to skip winter in the north, but thinking of December and January as summer will likely cause me to pause throughout our stay. It's hard to think of November as spring, but its easy to set the details aside and and savor the lovely blooms even though they don't fit with my idea of the end of the year. Remembering we are a day ahead of our family and friends was one of the little differences to keep in the forefront of our minds; remembering "Left is right" or "Driving on the left is correct" was another. Bill spotted another orientation issue: it's the north side of a building that's the sunny side, not the south. But the dominant winds are the generally the same in the middle latitudes world wide, usually coming from the west, as they often do here. Currency units are always an issue for travelers and we quickly injected a currency short hand into our conversations as talking about "US dollars, New Zealand dollars, and Euro's" was too cumbersome; they became "bucks, Z's and E's." It was tough enough making the currency conversions without stumbling over the many syllables too. Of course, having the same language as the New Zealanders immediately made things easier. The challenges of learning other languages is entertaining, but it is isolating and limits our options in complicated situations. We happily reaped the benefits from being able to have more sophisticated conversations with the local people and were especially grateful for that ease as we anticipated about 100 phone conversations for lodging. Most of the time we had little difficulty communicating with New Zealanders, but in person and on TV there were times neither of us had a clue what had been said. Some how the clerk's pronunciation of the word "wet" was totally unrecognizable to us and the slightly different pattern of phrasing left us guessing as to the meaning sometimes. The different idioms are fun, like "$5 dearer" rather than "$5 more expensive." "Long drops" are out door toilets, "Hotels" often are bars without lodging, and "All Blacks" are their world class rugby team that are frequently referenced in the news and commercial media. 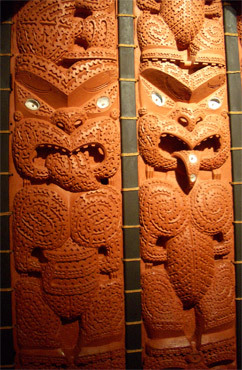 Red ochre colored Maori wood carvings. Our first full on-foot day in Auckland was getting the mechanics of being tourists in the country figured out; our second day was creating a historical context for what we would be seeing in the coming months. The city's main museum turned out to be a better than expected place to begin. We carefully studied the extensive exhibits on the Maori culture and that of the other south Pacific islands to get familiar with the South Pacific geography and to understand the more recent social back drop on the islands. As we wandered deeper into the museum, the displays took us back to the beginning--the real beginning--as New Zealand emerged from the ocean floor and then separated from the super continent Gondwana about 85 million years ago. We learned of the 2 opposing subduction zones that create deep trenches off both the southwest and northeast coasts and the high mountain range that results from the twisting and pressing of these ocean plates and that keep New Zealand's volcanic history alive. Learning about the continental plate movement 85 million years ago revealed the secret as to why there were no mammals on New Zealand until humans arrived a thousand or so years ago. Short on time, we had to rush past the tree exhibits but were at least alerted to the fact that there are some fascinating things we need to learn about New Zealand's unique flora as we travel around the islands. 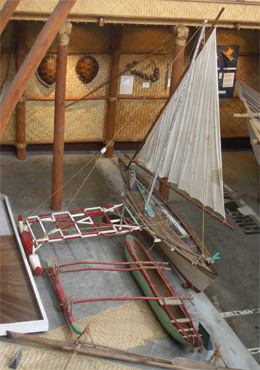 South Pacific island outrigger canoes. The war exhibits on the top floor of the main museum were less interesting but allowed us to see familiar stories from the New Zealand perspective. We've been at or near some of the big battles the Kiwi's were involved in, like Gallipoli, Turkey in WWI and Cassino in Italy in WWII. The New Zealanders, like the Turks, carved their national identity out from the battlefield experiences at Gallipoli and spoke of it in many of the same tones. The visit to the museum, then an art and a maritime museum the next 2 days completed our crash course in New Zealand history. A thick but fast reading history book and a tiny field guide to New Zealand's trees had us leaving Auckland feeling well enough prepared to understand much more of what we'd be seeing than when we arrived. Until 2 days ago, we were about where you left us last time, plodding along on the east coast of New Zealand's North Island. We left Auckland, pedaled south along the Hauraki Bay on the east side of the northern finger of the island, then turned a sharp corner and headed north into the wind up the Coromandel Peninsula on its west side. We cut across near the top of the Peninsula and turned south again, methodically working our way along the eastern coast of the Peninsula and along the Bay of Plenty. But it wasn't the Bay of Plenty to us and we abruptly abandoned our coastal route (and 8 nights of reservations), making a sharp turn south and inland to Rotorua (yes, for some of us, it sounds too much like (Roto-rootor".) It was a wise choice, as you'll learn in the upcoming updates. And Happy Thanksgiving to the American's among you.